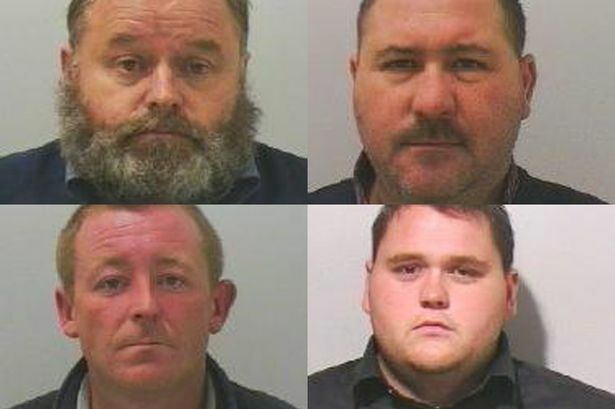 A blackmail gang who bombarded small business owners with “vile threats” to extort cash has been jailed for a total of 31 years. William Adams and Terence Cunningham Snr staged the sophisticated scam during a 12-month operation and targeted businesses in Newcastle, Birmingham, Hull, Devon and Sheffield. When victims refused to pay, the gang made threatening phone calls claiming to be Big Fat Gypsy Wedding star and Celebrity Big Brother winner Paddy Doherty. There is no suggestion Mr Doherty had any connection with the group. Jailing the five-man gang for a total of 31 years, Judge Roger Thorn QC said: “Over a 12-month period a well-planned conspiracy was in operation to blackmail, with utterly vile threats, victims who were themselves utterly honest, decent and members of the community. The gang struck at the Norman Burgess premises on St James’ Boulevard, in Newcastle city centre, in which they demanded £16,000 for unwanted work. And they also visited the Briar Dene pub on The Links, Whitley Bay, and threatened David Horgan – boss of the Sir John Fitzgerald pub chain - that they would park 200 caravans on the pub car park. Adams, 46, and Cunningham Snr, 48, both of Sutton Road, Askern, South Yorkshire, were handed eight-and-a-half year sentences and made the subject of a director disqualification order for five years. Terence Cunningham Jnr, 26, of Sutton Road, Askern, was handed a six-year jail term and a director disqualification order. Darren Squire, of Manor Road, Askern, will serve four years in prison. All were sentenced for a charge of conspiracy to blackmail. Michael Howley, 72, of Highgrove, Messingham, Scunthorpe, who is already behind bars for washing dirty cash, was found guilty of money laundering. He was given four years behind bars. Det Insp Alan Turner said: “This sentence sends a message out to organised and serious crime groups that if you decide to commit crime then you will be the subject of a thorough and rigorous investigation and brought to justice.